Sri Ranga Natha Swamy temple is a Hindu temple located in Jiyaguda, Hyderabad.Sri Ranga Natha Swamy temple is one of the most sacred of temple of Sri Ranganatha on the bank of Musi River. It is located near to High Court of Andhra Pradesh, and near to Purana Pul (old bridge). Sri Ranganatha is a Hindu God well-known in South India. The abode is a resting form of Lord Vishnu, one of the foremost of Hindu Gods. His consort is Goddess Lakshmi, also known as Ranganayaki. It is one of the most sacred of Ranganatha temples. Ranganatha, or the reclining posture of the God, can be found in this temple. The people celebrate the main festival during Ekadasi Festival celebrations. 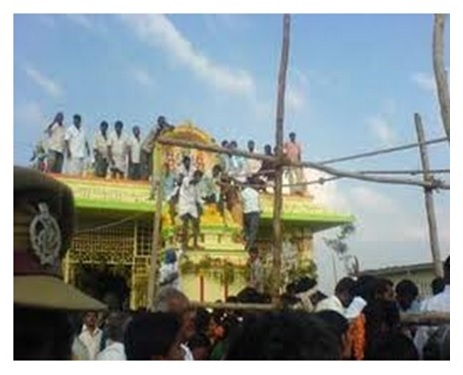 Major celebrations are held at Sri Ranganatha Swamy Temple marking the Vaikunta Ekadasi. The Ekadasi celebrations coincide with the month long celebrations of Dhanurmasa. Celebrations are held in accordance with the full Vaishnavite traditions. The devotees have an experience similar to attending the Brahmotsavams of Tirumala by witnessing the special decorations of temple deity during Ekadasi celebrations. Archanas are performed between 7 am and 12 midnight. Having the darshan of the special decorations of temple deity is an occasion of great spiritual importance, There are no tickets of any kind for the darshana, and the Archanas are performed free of charge. ISKCON Temple is located at Nampally in Hyderabad. It is one of the famous temples constructed by the ISKCON organization. The main deity of this ISKCON Temple is Lord Krishna. Other deities of this temple are Sri Gaura-Nitai, Sri Jagannatha Baladeva-Subhadra, and Sri Radha Madana-Mohana. 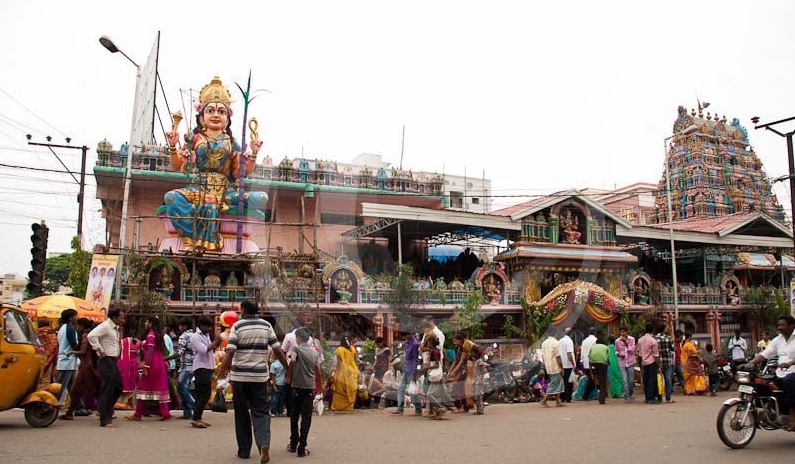 ISKCON Temple is usually crowded on Krishnashtami since thousands of devotees visit this temple.ISKCON Temple has been kept under strict watch by the police personnels. Many metal detectors have been set up at the gateways by which no frisking was executed. Usual programmes are performed on daily basis. On Sundays special programmes are performed.ISKCON Temple also distributes the Krishna Prasadam to nearly 1,000 devotees every month. Bhakti Vrksha facilitates devotees to get personal attention and guidance on how to exercise bhakti yogas and sustain good association. The International Society for Krishna Consciousness (ISKCON) was established by His Divine Grace Abhay Caranarvinda Bhaktivedanta Swami, affectionately known to his disciples as Srila Prabhupada. Born on September 1, 1896 in an orthodox Vaishnava family in Calcutta, India, he was named Abhay Caran by his doting parents. His father, Gour Mohan Dey, particularly wanted Abhay to become a great devotee of Sri Krishna, and worked hard to develop his natural affection for Krishna since childhood. Srila Prabhupada built 108 temples all over the world and spred the transidental knowledge of the vedas in different languages. Srila Prabhupada wrote and published many books his famous books are “Bhagwat Gita As It Is” (World Record), “Srimad Bhagwatam” (Set of 18 Vol. ), “Purna Purushottam SRI KRISHNA”, “Nector of Intructions”, “Nector of Devotion”, “Sri Ishopanishad” and many more. He started a magazine “Back To Godhead” in 1944 and now onwards it is spreding like anything. Now ISKCON have more 1000 temples & more than 4000 centre all of over the world. ISKCON is feeding more than 2,00,000 students per day with Krishna prasad free of cost and Providing free education on “Bhagwat Gita & Other scriptures”. Also spreding the Holy Names of Lord (Hare Krishna Hare Krishna Krishna Krishna Hare Hare Hare Rama Hare Rama Rama Rama Hare Hare) by Mantra Meditation. Regularly conducting Mahanagar Sankirtan and Lord Jagannath’s Rath Yatra every year, Celebrating Sri Krishna Janmashtami, Gour Pournima, Narsimha Caturdashi, Nityanand Triyodashi, Ram Navami, Balram Jayanti and other festivals every year and the regularly happening Sunday Feast program. 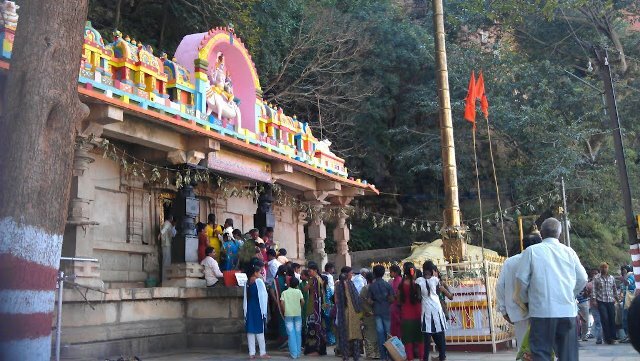 Akkanna Madanna Temple is located in Shalibanda and is popular during the festival of Bonalu. Akkanna Madanna Temple is a Hindu temple located in Hyderabad, Andhra Pradesh, India. It is popular during the festival of Bonalu that is celebrated in the twin cities of Hyderabad and Secunderabad. Akkanna Madanna Temple is known for the ghatam procession during bonalu. Akkanna Madanna Temple was built during the time of Tana Shah of Golconda period by two brothers Madanna and Akkanna. Ashtalakshmi Temple has Goddess Lakshmi as Ashtalakshmi in all her eight forms. 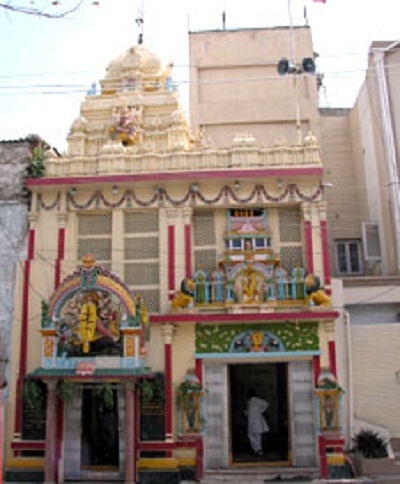 This temple is located in the Vasavi Colony, Dilsukh Nagar locality of Hyderabad. Ashtalakshmi Temple is a popular Hindu temple of Goddesses Ashtalakshmi in Hyderabad, India. This magnificent temple dedicated to Goddess Lakshmi stands distinctly on the outskirts of the city of Hyderabad. Amidst the varied Islamic architectural monuments in Hyderabad, this temple has a different style – a touch of the south-Indian architecture. In India, among the Hindu pantheon, the Goddess of wealth, Lakshmi, finds a special place in the hearts of the people for she brings prosperity and happiness as well as salvation. But very few temples have Goddess Lakshmi in all her eight splenderous forms. 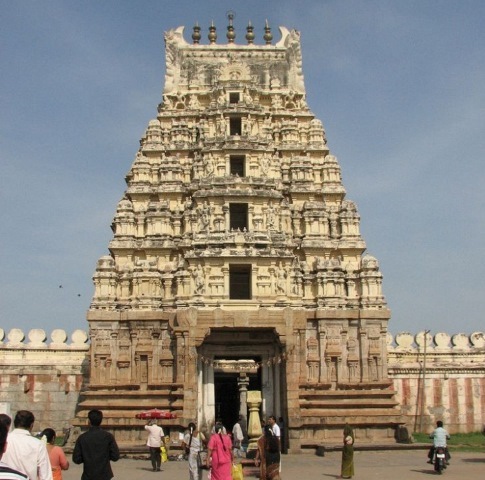 Built under the auspices of the Kanchi Kamakoti Peetam, the temple was consecrated in April 1996, and is one of its kind in the state of Andhra Pradesh. This temple is located between Dilsukh nagar and LB nagar, alkapuri near kothapet(NH 9). The design and architecture of the Ashtalakshmi temple was borrowed from the one at Chennai (new name for Madras). However, several modifications were made while the construction was initiated. 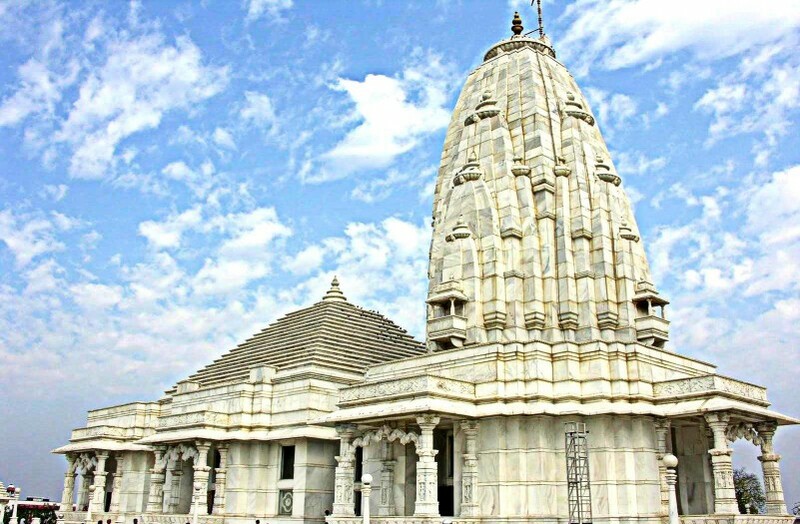 The Ashtalakshmi temple is a fine example of a collective endeavor. People from various quarters came forward to donate liberally. It took five years of non-stop work and a total expenditure of Rs 10 million for the magnificent Ashtalakshmi temple to take its present form. The well-known architect,Padmashri S.M.Ganapati Sthapathi,and M.Mathiyalagan sthapathi conceived the structure and design of the temple. The idols of Ashtalakshmi, Sriman Narayana, Sri Ganapathi and Sri Garuda were designed by . About 134 vigrahams (idols) of lesser – known gods adorn the mahagopuram. 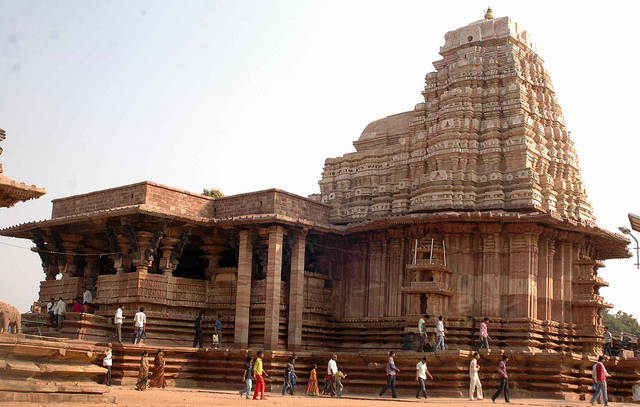 Although built of sand and cement, the Ashtalakshmi temple reveals the remarkable dexterity of the artists. Installed inside the temples are idols of Adilakshmi, Aishwaryalakshmi, Santanalakshmi, Dhanalakshmi, Dhanyalakshmi, Gajalakshmi, Vijayalakshmi and Varalakshmi. Depicting these eight postures, the idols are adorned with gold and – kasula peru necklace and other necklaces. If one is all praise for the richly ornamented idols inside the temple, one is equally agog to see the intricately carved designs on the temple gopuram. Proposals are in the offing to construct a two-storeyed Kalyana Mandapam at a cost of Rs 15 million and an Archaka nilayam- residential quarters for the priests. The nightly illumination of this enchanting temple is spectacular. Viewed from a distance, the temple looks like one made from marble. And on approaching the temple entrance, one is captivated by the tranquility of the surroundings and the all pervading sweet fragrance of the incense. Best time to visit: The best time to visit the Ashtalakshmi temple is during the festival of Varalakshmi and during the festival of Diwali- the festival of Lights. 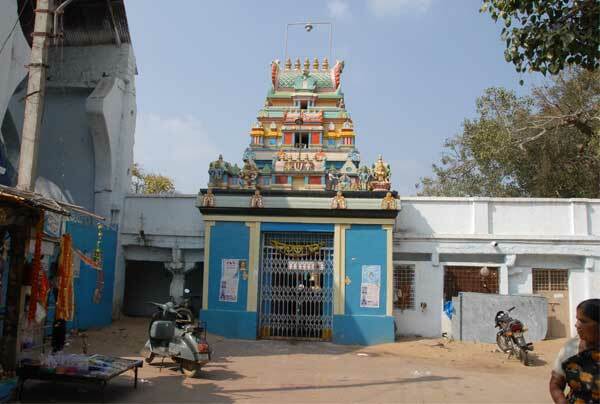 Balkampet Yellamma temple is located at Balkampet. It is very famous among Bonaalu and on Sundays..
Balkampet Yellamma Temple The temple of “Sri Ellamma” is considered to be existing from 15th century AD has taken its present form in 1919AD and “Ellamma” means mother to all. The idol of Sri Ellamma lies 10 feet beneath the ground level (cellar). 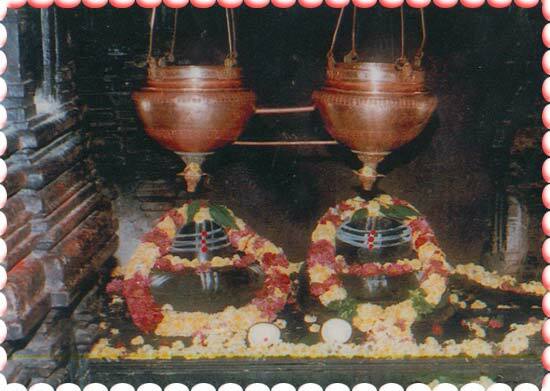 The well behind Sri Ellamma devotees believe that a bath with this water cures all skin diseases and epidemics. This water is taken as “Theertham”. To the south of this Balkampet Yellamma temple, the “Pochamma” idol was installed and “She” is the ruler of this sacred land or place. Sri Ellamma is also known as Bala Tripura Sundari, Bala and Balakamba. It is believed that Ellamma is Kaliyuga Avatar of Sri Chinna Mastha Devi whose upasana is one in Dasamaha Vidya of Tantsopasana. She is also believed to be Renuka Devi, mother of Lord Parasurama. Chilkur Balaji Temple popularly known as Visa Balaji Temple or Visa God , is an ancient Hindu temple of Lord Balaji on the banks of Osman Sagar Lake near Hyderabad, India. The Balaji temple is one of the oldest temples in the Telangana region built during the time of Madanna and Akkanna, the uncles of Bhakta Ramadas. Approximately, 75,000 to a lakh devotees visit the shrine during the week, but on Fridays and Saturdays, the temple gets close the cumulative of a week. Many of whom come to pray to Balaji for visas to travel or move to the US and other Western countries. And its head priest Gopala Krishna is instrumental for the temples popularity as Visa God. Chilkur Balaji Temple is also the only temple in India that does not accept any money, does not have a hundi, from the devotees. no green channel or privileges for VVIPs and it fought and won the right to stay out of government control except for the temple “Ramanuj Kot”, a temple in Jodhpur, Rajasthan. During the visit the devotee goes through the usual rituals of prayer, including eleven (11) circumambulations of the inner shrine, and makes a vow. Once the wish is fulfilled devotees then carry out 108 times around the sanctum sanctorum. The majority of wishes by devotees are visa related, thus Chilkur Balaji is also referred to as ‘Visa’ Balaji. The 11 circumambulations represent the secret of creation, 11 means 1 Soul and 1 Body, uniting both with devotion and full determination to fulfill wish, dedicate on the lord, there is no second, everything is god. In the 108 circumambulations, 1 represents the Existence, Almighty, God (Paramathma, balaji in the minds of the devotte), 0 represents Creation (Illusionary World, Jagath) and 8 represents Human Body need to come to this universe 8 months (Jivatma). God is everything, God does not want anything from devotees, God expects Devotion, Determination and Dedication from devotees. This Temple has chance to surrender the above aspects with God. Thanks to inventor of this Ritual. Chilkur Balaji Temple is located at Chilkur in the Hyderabad district. It is 33 Kms away from Mehedipatnam. Approximately 75,000 to 1,00,000 devotees visit in a week. Generally temple gets heavy rush on Fridays and Sundays. The temple at Chilkur is managed by the hereditary trustee Sri M.V. Soundara Rajan and Sri C.S. Gopala Krishna. The entire family of the archaka, including the women are dedicated themselves to serve the God.The temple is located on the banks of Osmansagar Lake with serene environs with lush green trees and small rocks in a village called as Chilkur. BRT is available to Chilkur Balaji Temple from Mehdipatnam,Hyderabad with APSRTC bus bearing service number 288D for every 15 minutes a bus, with 30 minutes drive from heart of Hyderabad City, Few other services are also available from APSRTC BRT. 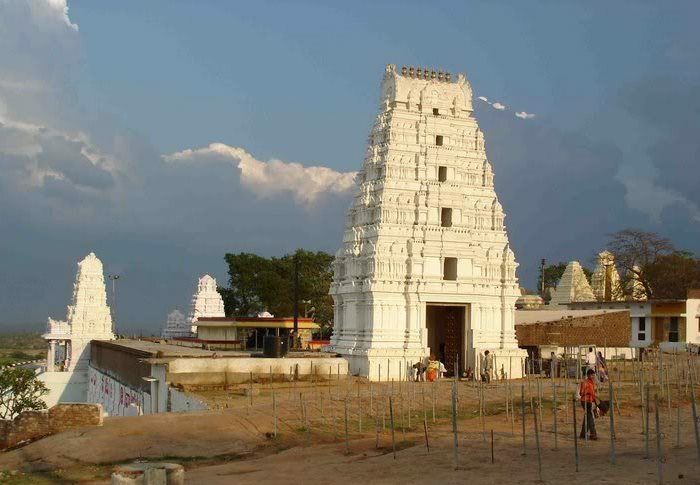 Chilkur Balaji Temple is Twenty Five kilometers away from Hyderabad off the Vikarabad road and on the banks of Osmansagar is the picturesque village of Chikur with its hoary temple dedicated to Sri Balaji Venkateshwara. From the style, structure and appearance, it can be inferred that the temple was built half a millennium ago. Set in sylvan surroundings, the temple attracts thousands of pilgrims every year and is an ideal place for sequestered retreat and meditation. It enjoyed in the past, great days of pomp and glory. Chilkur Balaji Temple is one of the oldest in Telengana, having been built during the time of Akkanna and Madanna, the uncles of Bhakta Ramdas. According to tradition, a devotee who used to visit Tirupati every year could not do so on one occasion owing to serious ill-health. Lord Venkateshwara appeared in his dream and said, “I am right here in the jungle nearby. You don’t have to worry.” The devotee at once moved to the place indicated by the Lord in the dream and saw a mole- hill there, which he dug up. Accidentally, the axe struck Lord Balaji’s idol covered by the mole-hill below the chin and on the chest, and surprisingly blood started flowing profusely from the “wounds”, flooding the ground and turning it scarlet. The devotee could not believe his eyes when he saw this. Suddenly he could not believe his ears also when he heard a voice from the air which said,”Flood the mole-hill with cow’s milk. “When the devotee did so, a Swayambhu idol of Lord Balaji accompanied by Sridevi and Bhoodevi(a rare combination) was found, and this idol was installed with the due rites and a temple built for it. Sri Balaji venkateshwara, the Pratyaksha Daiva in kaliyuga, is thus available at Chilkur to shower blessings on His devotees who for any reason are unable to go to Tirupati. Many devout worshippers flock to the temple, to receive the blessings of the Lord and his consorts throughout the year particularly during the Poolangi, Annakota and Brahmothsavams with the earnest desire to revive the former glory and importance of the temple, the idol of Ammavaru was installed in 1963 the year following the Chinese aggression, and when the aggression was unilaterally vacated, Ammavaru was given the name of Rajya Lakshmi, signifying this welcome event. The unique feature of this idol is that lotus flowers are held in three hands and the fourth hand is in such a position towards the lotus feet which signifies the doctrine of Saranagathi. Chilkur Balaji Temple has been visited by great Acharyas from time to time. A visit to the temple is a must for the Jeer of Sri Ahobila Mutt every time he visits the twin cities, and in the temple is installed the idol of the first Jeer. The Tilakayaths of Sri Vallabhacharya Sampradaya have been regularly visiting the shrine. Jagadguru Sri Sankaracharya of Sringeri Mutt and his disciple graced the efforts of the trustees in improving the temple. Karmanghat Hanuman Temple is located at Karmanghat, closer to Sagar Ring Road, it is a marvellous temple of Lord Hanuman. It is also said to be one of the oldest temples in the city. Karmanghat Hanuman Temple was built in 11th century A.D (approximately 1143). When a Kakatiya king went hunting and was resting under a tree, he heard the chanting of Lord Rama’s name. Wondering who it was in the middle of a terrible forest, he discovered a stone vigraha of Lord Hanuman, in seated posture and the voice coming from the vigraha. Having paid his respects, he returned to his capital, and that night, Lord appeared in his dream and asked him to construct a temple. Karmanghat Hanuman Temple was built immediately and successive kings ruled it well. About 400 years later, Aurangzeb sent out his armies to all corners of the country to wipe out hindus and hindu temples. At this temple, the army couldnt even step close to the compound wall. When the general reported this to Aurangzeb, he himself went with a crow bar to break down the temple. At the threshold of the temple, he heard a deafening roar rumblning like thunder, and the crowbar slipped from his hands as he was shaking in fear. Then he heard a voice in the heavens “Mandir todna hai rajan, to karo man ghat” (“if u want to break down the temple king, then make ur heart stronger”) which is why the place got the name kar-man-ghat. And to this day, Lord Anjaneya sits peacefully meditating and blessing devotees, as Dhyana Anjanyea Swamy. Karmanghat Hanuman Temple has eight-and-half centuries-old historical temple which has withstood not only Mughal emperor Aurangazeb’s vain bid to pull it down but also the vagaries of nature has now fallen into the clutches of land sharks. The Dhyananjaneya temple located at Karmanghat village in Saroornagar mandal near Hyderabad was built by Kakatiya ruler Prataparudra II in 1143 AD. It was then in the midst of a thick forest and the temple was built near a village called Lakshmigudem, now known as Karmanghat village. The village got its name following Aurangazeb’s attack on the temple in the 17th century. It is said that when Aurangazeb and his army annexed Golconda and began destroying everything in their path, that his soldiers came to the Dhyananjaneya temple. The army could not proceed their course of action due to divine intervention. “Aurangazeb himself came to the temple and heard a loud voice which said, hey Rajan Mandir Todna hai to pehle tum karo man ghat’ (if you want to break the temple, strengthen your heart first),” says a leaflet published by the authorities about the shrine. As the years passed, the ‘Karo Man Ghat’ changed to Karmanghat and the area came to be known as Karmanghat. The temple is now spread over 3 acres. It also has a one-acre pond. Katta Maisamma Temple is located at Lower Tank Bund. It is popular during the time of Bonalu festival. Katta Maisamma Temple of Hyderabad is principally dedicated to the Mother Goddess Maisamma. The Goddess is an epitome of ‘Shakti’ or strength. It is faithfully believed that the worship of this goddess in the Katta Maisamma Temple imparts power within a person by virtue of which he or she can win over all the adversities of life. Katta Maisamma Temple denotes a bridge across a river or a lake. The people living in Andhra Pradesh’s Telangana region established the Katta Maisamma Temple to procure the Goddesses’ favor and blessing for the well being of the people crossing the bridge. In the month of Ashad (July), the temple witnesses a large crowd of devotees for the “Bonalu” festival. The month of Karthik is also marked here with grand celebrations. The people in Andhra Pradesh have depicted ‘Katta Maisamma’ as the supreme power. She has been looked upon as the all powerful, the eternal, as well as the giver of health, prosperity and happiness. ‘Mother Maisamma’ in the Katta Maisamma Temple in Hyderabad is religiously worshiped with great faith and devotion. If you are a resident of Hyderabad or you are planning to visit the city soon, you should never miss the privilege of witnessing one of the oldest and most significant place of worship, the Katta Maisamma Temple of Hyderabad. Very Colourful Local Festival – More popular in Telangana Regions of AP) celebrating community. The word “Peddamma”, which is “Pedda+Amma”, literally means ‘Mother of Mothers’ or “The Supreme Mother”. She is one of the 11 forms of Village Deities and The Supreme most. The Temple is a must-visit during this “Bonaalu” festival which occurs during June-July every year. People offer their prayers and scrifices to The Mother round the year, and The Mother bestows Her warm to the devotees. Durga Puja is the most important festival of Hyderabadies. Consisting of series of rituals this five day long homecoming welcome of Goddess Durga is close to every Bengalis heart and soul.Durga Puja means more to us than just a religious festival.It is a celebration of life, culture, popular customs and traditions … it is a time for coming together, of reunion and rejuvenation, of the rebirth of our piousness and last but not the least, the season to love, to share and to care. This year the goddess arrives on an elephant and departs on boat. Goddess Durga’s arrival on elephant signifies good harvest while her departure on boat signifies good harvest and flood. Let us celebrate Durga Puja in a whole new way this year, and welcome Goddess Peddamma with an open heart and festive fervor. The Supreme power and the mother of all Gods and Goddesses, Maa Peddamma is the ultimate primordial being and the demon slayer. This Devi with lush black hair, beautiful eyes and ten hands dawned on earth to establish the supremacy of goodness over evil. In a battle fought over a span of ten days, Maa Durga wins the ceaseless battle between Gods and demons. Durga pujo is a way to celebrate this eternal manifestation of truth and purity. Devi Durga, the daughter of Himalaya, is an epitomy of graceful beauty, motherliness, and the strong and valor warrior. There is no clear evidence about the existence of the temple. But it is considered that the temple is here since about 150 years. Only in the year 1993, it took place in a big way and the Rajagopuram was constructed. Hundreds of people come to this temple and it looks every day like a festival. People believe in “Amma” and the temple is very popular in the twin cities, next to “Ujjaini Mahakali Temple” Secunderabad. The devotees pray to “Amman” as their own mother and believe that she is the saviour. Unlike the utsavams i.e., Bonalu once a year, here is this temple the Bonalu utsavams performed every Sunday. Beside the common people, politicians, VIPs, Industrialists come to this temple and perform pujas in this temple.This is a 300 year old temple located in Gospadu Village. The deity is being worshipped since around 300 years and the pujas were being performed here by the ancestors of Mr. Midde Santi Peddanna. Here is their family photo. The temple was renovated in the year 1999 with the contributions from devotees. Its kumbhabishekam was performed by the Shankaracharya of Hampi Vidyaranya Virupaksha Math. In Sanskrit Durga means ” She who is incomprehensible or difficult to reach .” Goddess Durga is a form of Shakti worshipped for her gracious as well as terrifying aspect. Mother of the Universe, she represents the infinite power of the universe and is a symbol of a female dynamism. Durga, a beautiful warrior seated upon a tiger, was the first appearance of the great goddess. Also called by many other names, such as Parvati, Ambika, and Kali. Destroyer of demons, she is worshipped during Durga puja, most popular among Bengalis. Sri Ranga Natha Swamy temple is a Hindu temple located in Jiyaguda, Hyderabad. It is one of the most sacred of temple of Sri Ranganatha on the bank of Musi River. It is located near to High Court of Andhra Pradesh, and near to Purana Pul (old bridge). Located near Ramoji Film City. Timings : 6am to 1pm and 4pm to 8pm. Sanghi Temple, dedicated to Lord Venkateswara, graces a promontory overlooking Sanghi Nagar. This temple is named after the family of Sanghis, owner of Sanghi group of industries. This beautiful temple, which is located a top a hill has been constructed in South Indian style with deities of many Gods. It has now become a major spot of shooting of films. Also, the hill-top view is very refreshing and the calm breeze brings joy and peace. The best time to visit this temple is in the evenings during sun set. The sun-set view is just very beautiful. Sanghi Temple, located at Sanghi Nagar in Andhra Pradesh in India, is about 35 km from Hyderabad city. The sacred Raja Gopuram, which is very tall, can be seen from several kilometers away. Sanghi Temple complex is located on the top of Paramanand Giri hill, which attracts a number of devotees who seek the gods’ blessings. The beauty of the slope around the temple is a popular view among its visitors. As you approach the Paramanand Giri, the gateway, or Maha Dwaram, welcomes the visitors. As you further proceed, the stone elephant is seen at the stairway. There are three Gopurams seen at the foot of the hillock which are so tall and seem as if touching the heavens. On the top of the temple complex, one can see the shrine of Lord Anjaneya, the son of Anjana devi and Wind God, who is believed to shower his blessings to his devotees. Sanghi Temple is constructed in South Indian style of temple architecture and houses all important Hindu God idols. 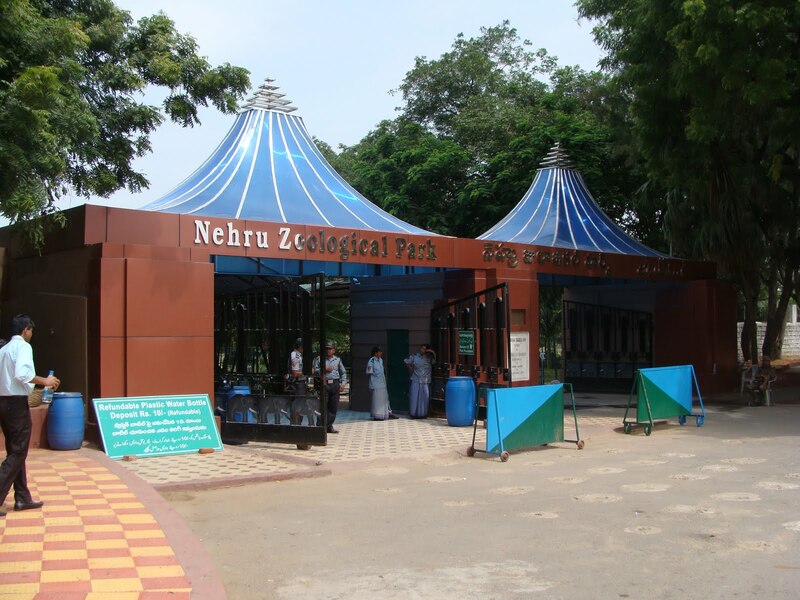 It is a favorite getaway point for the Hyderabadis as well as a popular tourist spot. The idol of Venkateshwara inside the sanctum sanctorum is 9-½ ft tall. There are small temples inside the complex dedicated to Padmavati, Shiva, Rama, Anjaneya, Ganesha, Navagrahas, Goddess Ashtalakshimi, Durga and Kartikeya. There is also a Pavitra Vanam, or holy garden, in the temple complex where special leaves and flowers are grown for performing poojas. The temple opens at 5.00 a.m. For one hour, Suprabhatam is recited, followed by Archana to the deities from 6 a.m. to 8 a.m. General darshan for the devotees is allowed from 8.30 a.m. to 10.30 a.m. and again from 4 p.m. to 6 p.m. Poojas and Sevas are held between 6 p.m. and 8 pm. The temple remains closed between 12 p.m. and 4 p.m. and after 8 p.m. Weekly Abhishekam is performed to the deities between 8 a.m. and 9 a.m. (Sri Ramalingeshwara (Mondays), Sri Hanuman (Tuesdays), Sri Venkateshwara, Ashtalakshmi, Parvathi, Padmavathi and Rama(Fridays). Timings of Sanghi Temple 08.00 a.m. to 08.00 p.m.,break b/w 1pm to 4pm on all days except notified public holidays. Other attractions of Sanghi Temple Cultural Film shows on all weekends in the afternoon. Located at padma rao nagar, also called “skanda giri temple”, about 2 km from secuderabad railway station. The word “skanda+giri” means the hill of lord skanda, another name of lord subramanya. Lord subramanya is primary deity is accompanied by sri valli and sri devasena. The other important sannadhis are lord sundara ganapathi, ekambareshwarar (lord shiva) accompanied by goddess kamakshi, sri varadharaja perumal with goddess sridevi and sri bhudevi and goddess jaya durga. sri subramanya swamy temple follows tamil sampradaya in terms of rituals, however, celebrates important festivals as per both tamil and telugu calenders. 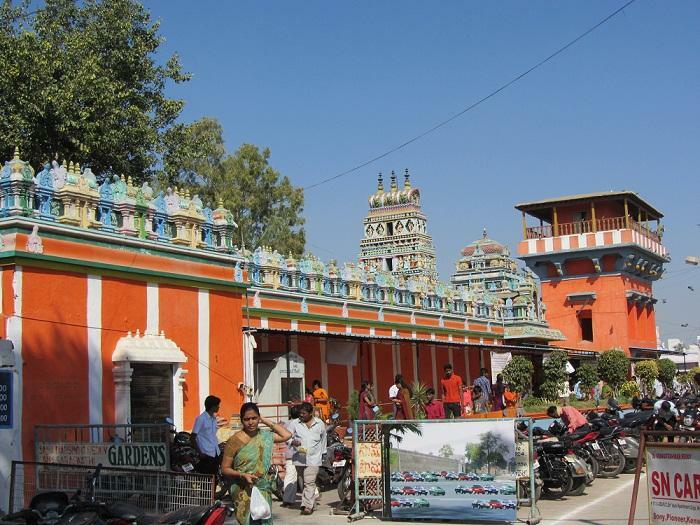 Sri Ujjaini Mahakali Temple is a temple in Hyderabad at Secunderabad area in Andhra Pradesh which is 191 years old. Devotees offer prayers to the goddess every day. In particular, Lakhs of devotees in Ashada Jathara pray on principal days, which fall on Sunday and Monday. It is also popular during the festival of Bonalu. 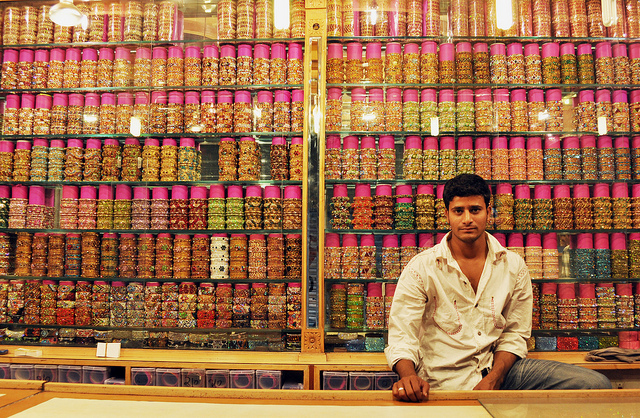 Located at Mahankali street, Ramgopal Pet, near Paradise. Ujjaini Mahankali Temple is a highly revered shrine located in Secunderabad, Andhra Pradesh. Built in 1815 by Suriti Appayya, a resident of Secunderabad, the temple is dedicated to Goddess Kali. The original idol was a wooden statue later replaced with a marble statue and re-consecrated in 1964. 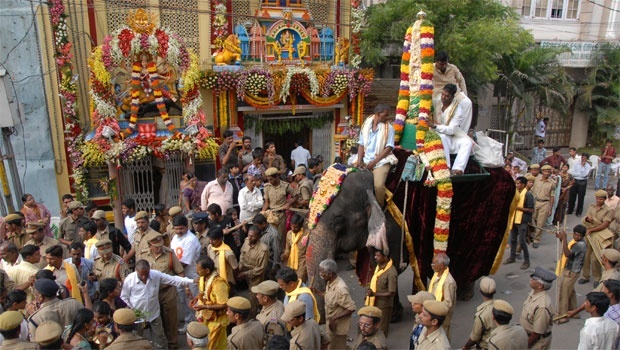 The annual Bonalu Festival celebrated amidst much pomp and splendor is a major draw. 2017 Copyrights exploretelangana.com. All Rights Reserved.